Clipping Chix: Target: Little Debbie Christmas Tree Cakes only 84¢ with Printable and Cartwheel! 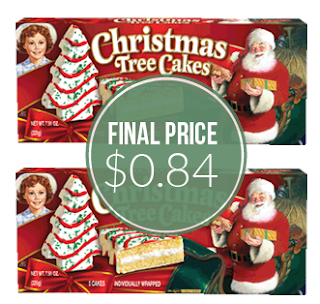 Target: Little Debbie Christmas Tree Cakes only 84¢ with Printable and Cartwheel! Target has a 25% off Cartwheel offer for Little Debbie Christmas snacks. Stack the Cartwheel offer with a $0.75 printable coupon for a final price of just $0.84! Note: You must unlock the coupon by sharing. Total 84¢ after coupon and cartwheel!